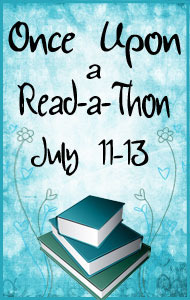 Today is Day 3 of the Once Upon a Read-a-Thon! 9:00 PM - I spent the day at a local quilter's store, and am now listening to a lecture for class. As soon as the post-lecture quiz is done, I'm off to bed! It was a nice thought, and the whole read-a-thon was incredibly well-organized. Things just didn't work out this time. Oh well, better luck next time! Hope you all had a better read-a-thon than I did!